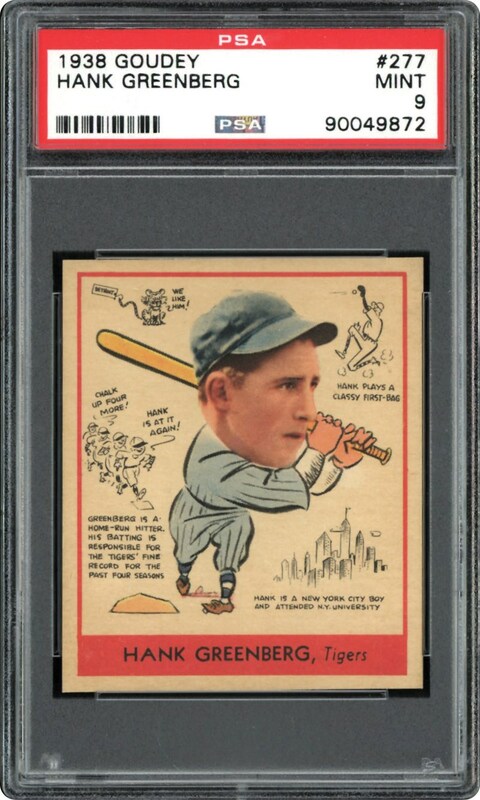 Lot # 125: 1938 Goudey “Heads-Up” #277 Hank Greenberg (PSA Mint 9) - “1 of 3” & HIGHEST GRADED Example! 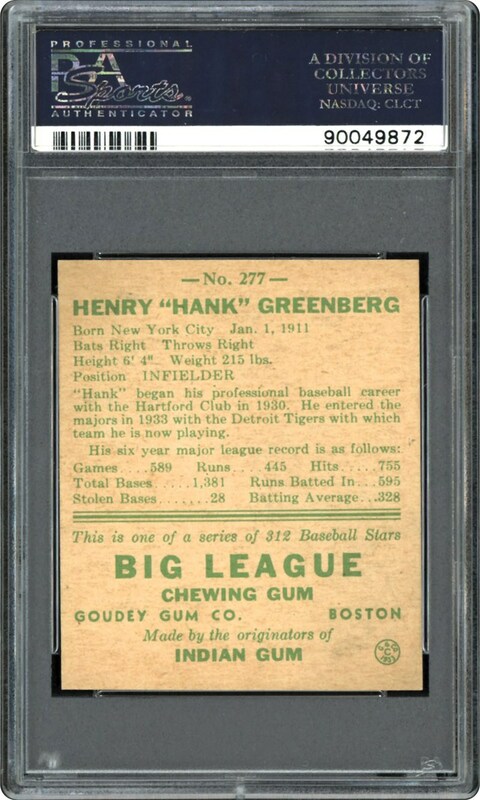 1938 Goudey "Heads-Up" #277 Hank Greenberg (PSA Mint 9) - "1 of 3" & HIGHEST GRADED Example! Miraculous to say the least, this 1938 Goudey PSA Mint 9 #277 Hank Greenberg offering stands alongside a meager two other examples as the finest of its kind! Ironically, its pinnacle stature is synonymous with Greenberg's incredible batting prowess that places him as one of the most formidable first baseman in baseball history. Due to WWII, Hall of Famer Hank Greenberg played only nine full seasons in the Major Leagues, compiling 2 MVP awards and averaging over 35 homers and a staggering 140+ RBI's in his spectacular career. In 1938, he chased Babe Ruth's legendary 60 home run mark, ending the year with 58 round-trippers, and along with Jimmie Foxx and Lou Gehrig, he is considered one of baseball's greatest 1st sacker sluggers to ever step into the batter's box. The brilliant Greenberg batting pose including a cartoon line drawing emulates vibrant hues, with the bold red frame centered virtually "dead-on" 50/50. Razor sharp corners, pristine-like surfaces, bold printed text, and an immaculate verso are the final compliments for this "time-defying" marvel that like Greenberg's seemingly unparalleled power, claims the distinction of standing at the top of the illustrious PSA "Pop" chart!